Vital Nutrients mission statement states that they clearly aim “To manufacture superior quality nutraceuticals that exceed both industry and government standards and provide clinically effective results.” Vital Nutrients sets the bar for purity, stability and consistency using the highest standards of manufacturing practice and laboratory quality assurance. Their qualified team of health professionals endeavors to ensure that their independently tested raw materials are formulated to produce the best clinical outcomes. Their research based products are guaranteed to contain true therapeutic doses of the most beneficial active materials. 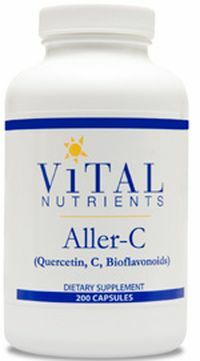 Aller-C Quercetin & Bioflavonoids – This product supplies allergy and sinus support in a potent and effective formula that aids in maintaining normal respiratory and sinus function. Ultra Pure Fish Oil 700 Lemon – Each pleasant tasting softgel provides 1200 mg of high potency, pharmaceutical grade, ultra pure deep sea fish oil for cardiovascular and cell membrane support. BCQ – This powerful herbal and antioxidant formula provides support for joint discomfort and inflammation. Multi-Nutrients No Iron or Iodine – This well tolerated bioavailable formula contains high potency vitamins, minerals and trace elements to provide the highest nutritional value for all bodily systems. Vitamin D3 2000 IU – These easy to swallow capsules promote calcium absorption and bone health. Acetyl-L-Carnitine Powder – This product acts to increase certain neurotransmitters that assist and enhance brain function in mild memory problems associated with aging. Osteo-Nutrients II with Vitamin K2-7 – This comprehensive bone support formula contains high amounts of elemental calcium and magnesium as well as other essential nutrients for healthy teeth and bones. Betaine HCI with Pepsin and Gentian Root Extract – This combination of nutrients is beneficial for promoting healthy digestion and mineral absorption. This entry was posted in Home and tagged Acetyl-L-Carnitine Powder, Aller-C Quercetin & Bioflavonoids, BCQ, Betaine HCI with Pepsin and Gentian Root Extract, Multi-Nutrients No Iron or Iodine, Osteo-Nutrients II with Vitamin K2-7, Ultra Pure Fish Oil 700 Lemon, Vital Nutrients, Vitamin D3 2000 IU. Bookmark the permalink.